Rich Whip® and Coffee Rich® have been delighting users with great taste for more than 60 years. From coffee in the morning to dessert in the evening, we want to make every morsel count. Rich's® Whip Topping® was the world's first frozen non-dairy whipped topping. The product revolutionized the food processing industry, and sparked the advent of Rich Products Corporation, still one of the largest family-owned companies around the globe. 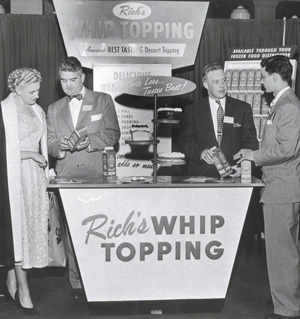 After experiencing success with Whip Topping, Rich Products began to focus on the development of a product that put the company on the map, Coffee Rich. The launch of Coffee Rich was the nation's first frozen, non-dairy creamer to hit the shelves. Rich Products, the manufacturer of Rich Whip and Coffee Rich, is now a global operation spanning across six continents. To learn more about Rich Products, please visit www.rich.com.